St George is usually depicted killing a dragon to prevent a maiden being sacrificed. After killing the dragon he then held forth with a magnificent sermon, and converted the locals for Christ. He was given a large reward by the king, which he distributed it to the poor before riding away. Popularily the dragon stands for wickedness and the maiden stands for God's holy truth. 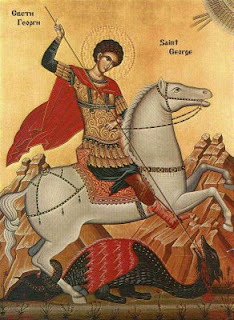 St. George was a brave martyr who was victorious over the devil. He was a soldier in the army of the Roman Emperor Diocletian, a pagan and a bitter enemy to the Christians. He put to death every Christian he could find. George was a real soldier of Christ. Without fear, he went to the Emperor and sternly scolded him for attacking Christians. He gave up his position in the Roman army, and was tortured before being beheaded. So boldly daring and so cheerful was St. George in declaring his Faith and in dying for it that Christians felt courage when they heard about it. Many songs and poems were written about this martyr. Soldiers, especially, have always been devoted to him. Because of his chivalrous act, dependence on faith and largesse to the poor, devotion to Saint George became popular in the Europe throughout the 10th century. A shrine built for his relics at Lydda, Palestine was a popular point of pilgrimage for centuries. Faithful servant of Godand invincible martyr, Saint George; favoured by God with the gift of faith, and inflamed with an ardent love of Christ, thou didst fight valiantly against the dragon of pride, falsehood, and deceit. Neither pain nor torture, sword nor death could part thee from the love of Christ. I fervently implore theefor the sake of this love to help me by thy intercession to overcome the temptations that surround me, and to bear bravely the trials that oppress me, so that I may patiently carry the cross which is placed upon me; and let neither distress nor difficulties separate me from the love of Our Lord Jesus Christ. Valiant champion of the Faith, assist me in the combat against evil, that I may win the crown promised to them that persevere unto the end. Amen.